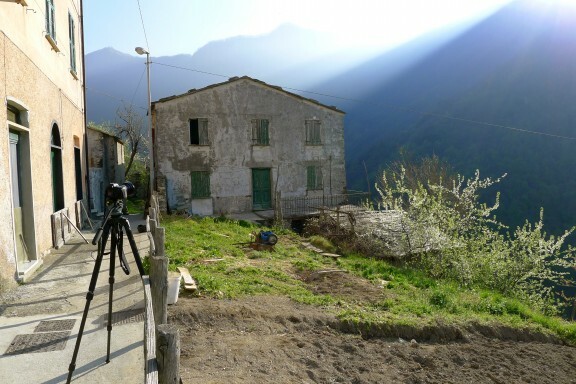 By now you’ll have seen the television show (if you haven’t you can find it on Netflix), and, as promised, here is my personal chronicle of Brian Boitano’s transformation of a 19th century stone house in the village of Favale di Malvaro, Italy. He started by knocking down some walls. The ground floor consisted of four small rooms, and Brian wanted to open it up to bring in light, take advantage of the mountain view, and create a space where family and friends could gather and socialize. This was not only a huge renovation, it had to be done in four months. The only man for the job was Enzo Pezzolo. Even with the hard work, there was a lot of fun and laughter. While Enzo and his crew were replacing stairs and floors and a roof, we went shopping. The flea market in Chiavari, the town where we were staying during the construction, was a gold mine for furnishing the house. Also in Chiavari, by some strange stroke of kismet, there was a skating rink. The local skating club was thrilled to get some tips from an Olympic gold medalist. The kitchen of the old house became the living room in the renovation. Enzo built this fireplace in a day, using an old roof beam as a mantle shelf. Brian brought chairs from home (dismantled and packed into a suitcase), found a sectional sofa at Ikea in Genoa, and accessorized with relics found on the property and flea market finds in Italy. Adjacent to the living room, was the dining room. Another wall was removed to open the space to the kitchen. A wine jug from the basement was turned into a pendant light for the dining room—with the help of Enzo and Donatello. Brian and his nieces, Krista and Aubrey, looked on as the bottom of the wine jug was cut off. Brian’s cousin, Luciano Boitano, owns an auto body shop which came in handy a few times – but not for car repair. Brian called on him when he wanted to paint the unfinished dining room chairs. The finished dining room: A table from Cambi Auction House in Genoa, hand-painted Italian ceramic plates and linen napkins from the flea market, glasses from Ikea, and, of course, the chairs painted a perfect shade of green, at the Boitano officina e carrozzeria. In the kitchen, the plaster was removed (noisily) and then replaced. Notice that the baseboards all over the house are painted, replicating what was there originally. Burgundy lacquered kitchen cabinets from Italian company, Snaidero, and a stove from Bertazzoni were installed. The contemporary cabinets looked amazing juxtaposed with the old house. The alcove next to the kitchen became a cozy banquette area where guests can hang out while Brian is cooking. The table, in the Boitano family for generations, is from 83 year old Giovanni Boitano, who lived down the lane. Cousin Luciano gave Brian his grandmother’s cheese cabinet – nieces, Krista and Aubrey, cleaned it up and converted it to a bar cabinet. While we’re on the subject of kitchens, let’s just talk about food for a moment. This region of Italy is particularly renowned for pesto and fish – and we ate a lot of both. We had this pasta with pesto at a local ristorante one day – served family style, wide strips of hand-made pasta were tossed with the freshest pesto you’ve ever tasted. Branzino baked in salt was another local specialty. They would fillet it at the table, and then serve with potatoes and olives. One of the highlights of the whole project was when we were invited to the Favale town feast. It was held on the side of a mountain, where long tables were set up among the trees, and many course of food were served to all. Turns out Enzo is multi-talented – he was the head chef for the day. Here he is making testaroli, which is like an Italian crepe. They were spread with pesto at the beginning of the meal, and with Nutella for dessert. We got to meet his lovely wife, Michaela, and their three happy children. Field trips were great, but it was always exciting to drive back up the mountain and see what was happening at the house. The upstairs of the house didn’t need walls removed, but there were some challenges. A charred room that had been used for roasting chestnuts became the bathroom – once Enzo worked his magic. Obviously, the room needed new walls, floor, and ceiling – but Brian wanted to keep as much of the stone exposed as possible. When we were back in the states, Enzo sent Brian a photo of a bathtub he found, and another showing how it would fit into the bathroom. When we got back to Italy Brian went to see the tub. This antique table was left in the basement and Brian and Enzo figured out how it could be repurposed as the vanity. The sinks are composite cement, and were purchased nearby. The mirrors and towel hook were flea market finds. An old ladder, also found in the basement, was cleaned up and became a towel rack. The bedrooms were in various stages of disrepair, but the plaster walls in the master bedroom were a beautiful turquoise patina. Enzo saved the walls, and exposed the beam above the window. Brian furnished the room with a custom made bed, nightstands found in the basement (the aunt’s didn’t get everything), lamps from the flea market, paintings from a friend, and linens from home. Brian found a chandelier and chest of drawers at the Cambi Auction House in Genoa, and a Chiavari chair from the Levaggi Chair Factory in Chiavari. Across the hall is the first guest room. The chandelier is also from the auction house, the nightstands were painted at Luciano’s body shop, and the round gold mirror on the wall was purchased by Brian’s nieces at the flea market. Brian bought the bed and the lamps at Ikea. The trip to Ikea in Genoa was a group activity. One of my favorite things at Ikea was the gelato machine – pop in a coin and it dispenses gelato into a cone! The third bedroom needed new plaster walls, but Enzo matched the original paint color, and was able to leave some of that gorgeous stone exposed. One of the house’s old window frames was hung on the wall, with family photos propped up in it. Once the house was finished, worker stuff was replaced with Brian stuff. The transformation of the outside of the house was just as stunning. Check out the shutter holders – they are shaped like little men. Last but not least, a terrace was created in front of the house for al fresco dining. What better way to celebrate the finished renovation than with a big Boitano family feast? THE BRIAN BOITANO PROJECT CAN NOW BE SEEN ON NETFLIX. My parents are from little mountain towns in Liguria that are very close to Favale di Malvaro. Dad grew up in Neirone, located in the valley just west of Favale, and Mom grew up in Gattorna, just below Neirone and on the main road to Chiavari. I try to visit my family in Italy once a year and love to spend time in Chiavari. This show was very special to me and I hope Netflix brings it back again even though I have watched it 2 or 3 times. I hope to visit Lorsica and Favale on my next trip. Anyone going to Liguria must visit Camogli and the Abbey of San Fruttuoso! Thanks, Henry! You can see The Brian Boitano Show on Netflix , and you can try the HGTV website “Be On TV” link to pitch your restoration project. Just watched this show yesterday. We are renovating a house in Northern Italy above Lake Como. I thought the show was really inspiring. We will probably be going into tge Milan area for furniture. If anyone has any info, we are trying to do similar things as Brian and the house is laid out like Brian’s, on 3 floors. Loved loved loved this show. Can’t remember the last time I truly enjoyed an HGTV show as much. Admire him for his reaction to the aunts’ stealing the furniture. When I get annoyed about something, I remember his gracious reaction and it tempers my own annoyance. If he did a show fixing other European family homes, I would definitely watch. Enzo and his crew are true masters. I missed all the broadcasts. Can they be seen online? Or on DVD or from Netflix? When visiting that area, I’ve often driven through Favale on the way up the mountain to Piano della Chiesa where my Cavagnaro ancestors were born. I’d very much like to see both the transformation of the house and the local scenery. Unfortunately the show has already aired and there are no plans for HGTV to air it again. Wow! An incredible show! My husband and I loved all of the episodes! We particularly enjoyed the last episode — celebrating the finished renovation with a Boitano family feast! I really loved the saw-horse tables too! Maybe he should reproduce these tables and sell them! Was disappointed only because there were so few episodes! I wanted it to go on and on and on and……………….. So sorry we missed “The Brian Boitano Project”! Just caught Brian on “The Kitchen”. We’re such fans. Will the first season be rerun? If so, when? Please consider rerunning it. When is the second season set to begin? Thanks! Check HGTV and Cooking Channel websites for future air dates of the shows. Hopefully we will be shooting a second season, but there are no plans to do so yet! Cross fingers! I was also fascinated by the awful aunts! How awful for Brian, I can’t believe they would do that to him. I noticed they weren’t at the family gathering! Enzo is a genius an incredible craftsman! A true master. He could have his own show with the transformations he completed. Brian your home is molto bella! I would love to purchase the chiavara chairs from the Levaggi factory any info on how would be appreciated. The Levaggi website is http://www.levaggisedie.it Be sure to tell Paolo that you saw him on the show! I loved this show. Watching the craftsman do their magic was wonderful. Brian’s design vision and appreciation for the heritage of the home was so great. I wish HGTV could have more real life hours restoration stories. I will watch every rerun I can find! I had to write and say how wonderful it was to watch this transformation unfold. My parents are from the Campania region of Italy and I often wonder what it would be like to restore my ancestors home. It was horribly damaged in the 1980 earthquake but it still has beautiful bones. I would only hope to find someone like Enzo in my parents neck of the woods to help us restore it. What Brian, Enzo and the talented craftsman did to create new history was beautiful. I love the old and new and I have to say Brian said it best when he commented about how he didnt want the furniture that was stolen from him because it held bad memories, now he looks at what he decorated with and has his own stories and memories behind everything. Unfortunately I have heard this many times of Italian families doing this, so it is no surprise to me, just shameful. So I very much liked that he forgot about it and moved on from that experience. Oh and Brian’s warm smile and laugh was contagious. I only hope he buys the the other homes in the family that are desperately need of repair and restores them because I would love to see what he does to them. Best of luck to Brian and his family! Auguri! Shows like this is what HGTV needs to do more often, instead of all the fake, scripted, phony drama garbage, (I’m talking to you, Love It Or List It), that is on there now. @Kim – Yes! The outing of the thieving aunts was my favorite! What did Brian say…apparently the lira is thicker than blood? How do you say touche in Italian? Just watched all the episodes last evening and LOVED them. Can’t remember the last time I watched something on HGTV this enjoyable. What an incredible experience to be involved with this project. The town, the home and the show’s characters were so charming – makes one want to run off to Italy to find their own villa to restore. A delight to watch from beginning to end! Love, love, love this series. Brian’s creativity and vision for the transformation is beyond words. What a memorable adventure to share and experience for all those involved made even more significant, accomplished with the help and love of his family. Magnifico! I want to run away and do the same. I will look forward to your post of resources for this project. Nina Ostensen – San Juan Capistrano, CA. Strangely, I found one of the most interesting parts of the show was the old Aunts stealing all the furniture when Brian returned to the States. I know he would have paid them more to be able to keep his family’s pieces, even though he had already bought and paid for them! You could tell he was nearly as excited with the furniture as the building. He let them off easy. I Could have watched a whole episode about his displeasure about it, confronting the Aunts, possibly ‘hunting’ down the pieces from the antique dealer, etc! LOVED the series, his wonderful taste, leaving lots of the old with the new…hated to see it come to an end! Can you tell me who the artist is who gifted Brian those lovely paintings? Hi Patty – I will ask Brian if it’s okay to pass on the artists’ name as soon as he returns from Sochi. Can you list or link to instructions for how the demijohn chandelier in the dining room was made? Please can you share a resource for the spider like light fixture that was inside the cut demijohn? Thank you. I will post a how-to on the blog this week – you are not the only person who has asked! I am amazed at the ‘beginning house’ and the ‘after house’. It’s almost inconceivable it’s the same house. Restoration is a good thing instead of just knocking something over and building a nouveau maison that isn’t authentic. Really love the pics. My favorite thing was that gelato machine. I wish the USA could put those in some malls here. I would go to it. Maybe like a photo booth/gelato machine type thing. Thank you for behind the scenes shots and details – so many details to love. The tiny men guarding the shutters! I’d give anything to pull up a chair at Favale feast. Interesting – my husband’s family in Northern California has 4 generations of summer Italian tradition, gathering in the mountains. Each July we share a dinner outdoors with many other Genovese families – the men start cooking early in the day. Long tables under the stars, accordions after dinner, wine bottles, antipasti, American babies with Italian names, the old people speaking in Genovese…. it is one of my favorite nights of every year. Enzo and MIchaela and the kids would fit right in! You are all invited! Thanks for the show, can’t wait to see more adventures. What a beautiful and fabulous odyssey! Thank you for sharing….cheers! I just loved watching the show! What an incredible transformation and attention to keeping the original integrity and style of the home. I love how simply and the cleanly the house is decorated. The wood, the stone, the plaster (washed walls) – to die for! Congratulations!!! What an accomplishment! A beautiful project. Congrats ten fold. I don’t know where to begin about how amazing this all looks!!! How lucky you are to have had such a terrific experience. I’m in awe. One of the things I loved the most are the walls….the colors, the exposed stone….oh I just can’t say enough.